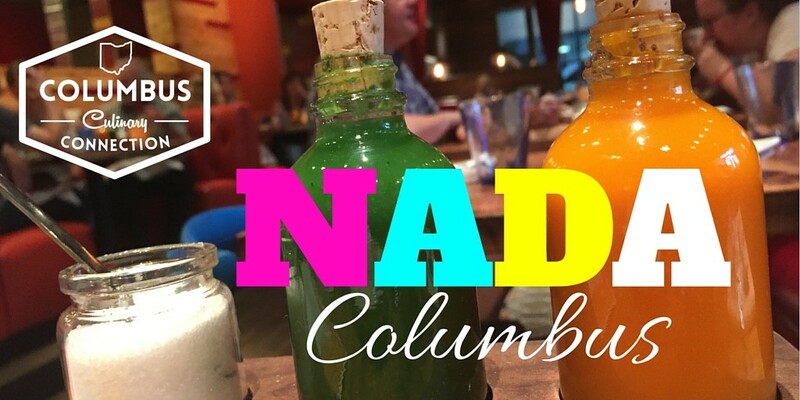 Be prepared to nosh on better-than-average Mexican selections at Nada, one of the new Cincy-based transplants to Columbus. 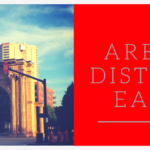 You can find the restaurant at a prime location in the Arena District, close to all the action at Nationwide, Huntington Park, and the LC Pavilion. The casual, rustic interior is warm and inviting, making it the ideal place to linger for happy hour drinks. The patio at Nada is also one of my favorites in the city; the view of the old Union Train Station arch at McFerson Commons is perfect. 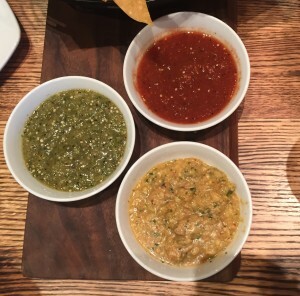 Start with the salsa trio, consisting of fire-roasted tomato ancho salsa, green jalapeño salsa verde, and flaming habañero salsa. 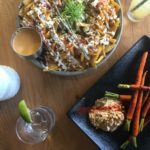 The habañero was too fiery for me, but my heat-seeking husband loved it. Try the guacamole too, it is creamy and satisfying, plus it helps cool down the salsa burn. Nada’s chips are made in-house, and are still warm upon arrival at the table to accompany any of the dips. Next visit, I’ll have to order the Short Rib Sopes, a tempting combo topped with crispy masa, crema, cotija cheese, and pickled onion. 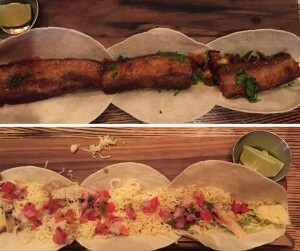 When it comes to entrees, there is no question – you must order the crispy pork belly tacos. Or make your dining companion order them and then steal one, it’s up to you. These mini tacos are a bite of heaven, served with guac, pickled veggies, guajillo diablo salsa, and cilantro. 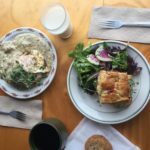 If pork belly isn’t your thing, other options include shrimp, chicken, barbacoa, carnitas, and even ribeye or salmon fillings. All the tacos come three to an order and are served on slotted wooden boards that keep the tacos propped upright. This is ingenious, because we all know of the depression which ensues after a taco topples over, leaving all of the fillings outside the shell. 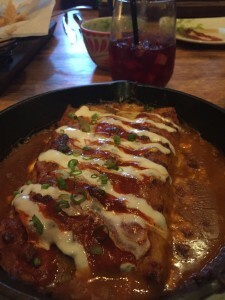 If enchiladas are what you’re craving, go for the chicken and corn version, an iron skillet of citrus marinated chicken, sweet corn, black beans, couscous, chihuahua cheese, and diablo salsa. You will not leave hungry! 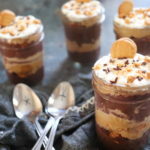 Don’t skip drinks and dessert either! Nothing goes better with the zip of hot sauce than margaritas, and mercifully Nada’s are on point. The tangy signature Nadarita will quench your tequila thirst, or try more adventurous varieties like mango-chile or prickly pear; all are a good balance of tart and sweet. 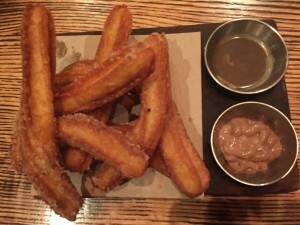 I also sampled the churros for dessert, deep-fried cinnamon sugar delights served with thick banana and chocolate dipping sauces. Yum! 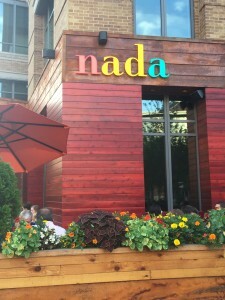 Culinary Clue: Nada also has a fabulous brunch menu as well. Think drippy eggs on everything and fruity morning cocktails. 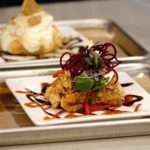 What is better to help pry your eyes open on the weekend than some spicy Latin flavors and tequila?